What these estimates do not cover is the amount of RDF based Linked Data generated "on the fly" by RDF middleware technologies (aka. RDFizers). Naturally, tracking the count of this form of Web is somewhat mercurial due to the fact that all of the RDFized data isn't necessarily available via a public RDF archive dump. 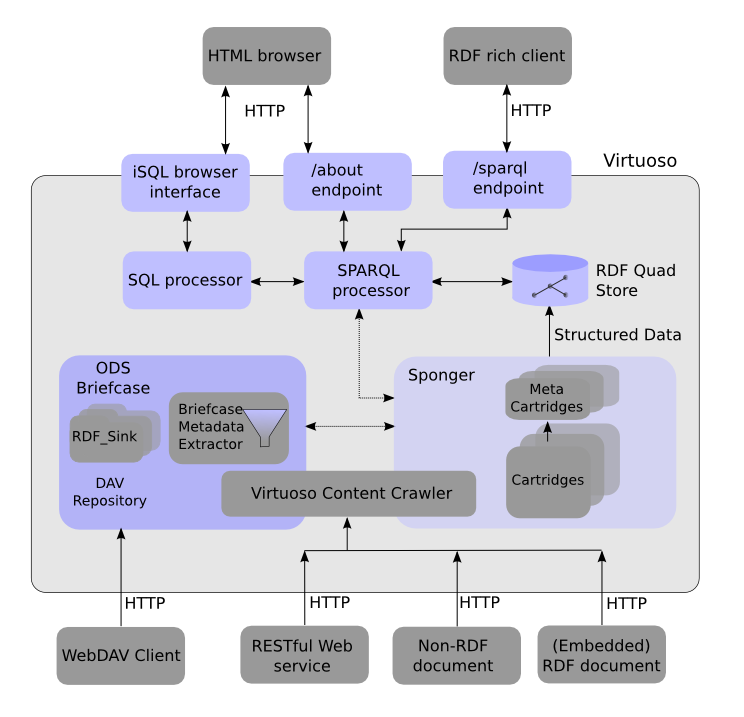 This white paper covers Virtuoso's in-built RDFizer middleware popularly known as the "Sponger"; an example of a very powerful cross platform solution for generating RDF Linked Data "on the fly". The Sponger exposes its service via the Virtuoso SPARQL Engine, Content Crawler, and a RESTful API. 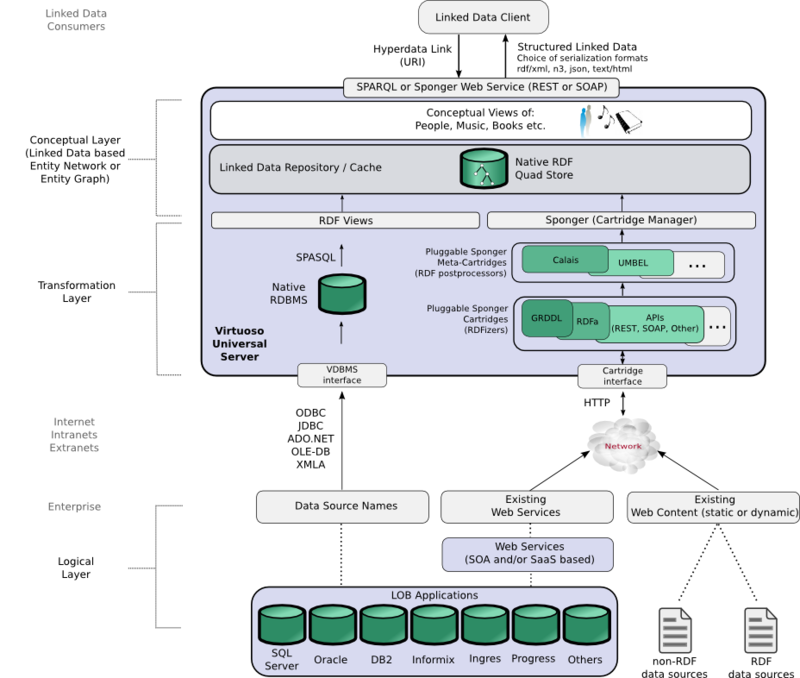 Other facets of Virtuoso's Linked Data related feature set are explored in the accompanying white papers Virtuoso RDF Views - Getting Started Guide and Deploying Linked Data . The Sponger is highly customizable. Custom cartridges can be developed using any language supported by the Virtuoso Server Extensions API enabling RDF instance data generation from resource types not available in the default Sponger Cartridge collection bundled as a Virtuoso VAD package (rdf_mappers_dav.vad). get:soft is the retrieval mode. Supported values are "soft" and "replace" or "replacing". If the value is "soft" then the SPARQL processor will not try to retrieve triples if the destination graph is already populated i.e isn't empty. The get:soft option must be present in order for the other get: options to be recognised. Values "replace" or "replacing" clear the local graph cache. get:uri is the IRI to retrieve if it is not equal to the IRI of the FROM clause. This option can be used if the data should be retrieved from a mirror, not from the original resource location, or in any other case when the destination graph IRI differs from the location of the resource. get:method is the HTTP method which should be used to retrieve the resource. Supported methods are "GET" for plain HTTP and "MGET" for a URIQA web service endpoint. By default, "MGET" is used for IRIs that end with "/" and "GET" for everything else. get:refresh is the maximum allowed age of the locally cached resource, irrespective of what is specified by the server where the resource resides. The option value is a positive integer specifying the maximum age in seconds. Virtuoso reads HTTP headers and uses the "Date", "ETag", "Expires", "Last-Modified", "Cache-Control" and "Pragma: no-cache" fields to calculate when the resource should be reloaded. The get:refresh option value can override and reduce this calculated value, but cannot increase it. But what if some or all of these resources were not present in Virtuoso's quad store? The highly distributed nature of the Linked Data Web makes it highly likely that these interlinked resources would be spread across several data spaces. Virtuoso's 'input:grab-...' extensions to SPARQL enable IRI dereferencing in such a way that all appropriate resources are loaded, i.e. "sponged", during query execution, even if some of the resources are not known beforehand. For any particular resource matched, and if necessary downloaded, by the query, it is possible to download related resources via a designated predicate path(s) to a specifiable depth i.e. number of 'hops', distance, or degrees of separation (i.e compute Transitive Closures in SPARQL). The HTML rendering is provided by description.vsp, a Virtuoso Server Page (Virtuoso's equivalent of ASP) which is invoked by the /about/html proxy. 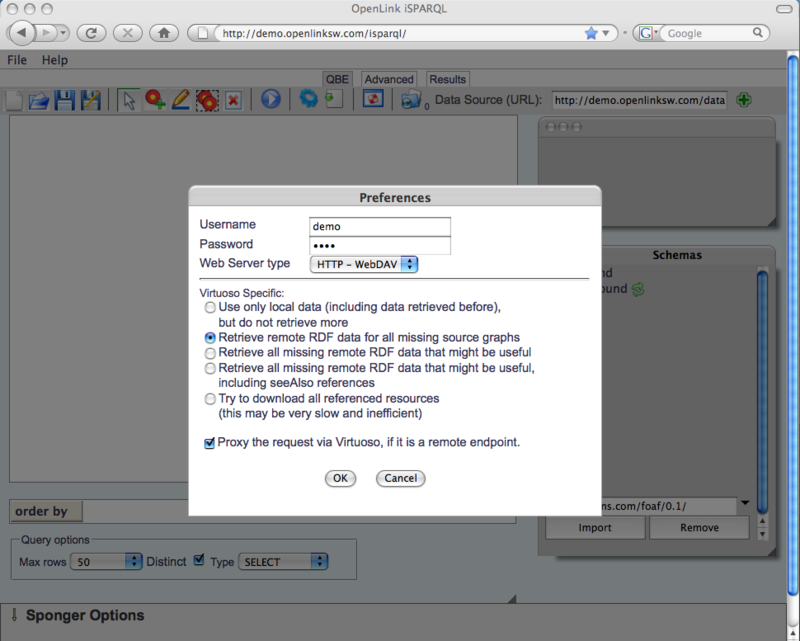 Description.vsp underpins the 'Page Description' facility (menu option 'View Page MetaData') in the OpenLink Data Explorer (see below). Whilst the simple HTML representation is adequate for many purposes, clearly the raw RDF returned by the /about/rdf or /about/id proxies is unlikely to be consumed in this way. The primary aim of the Sponger proxies is to provide a building block for RDF-aware client applications to request and consume sponged RDF metadata. 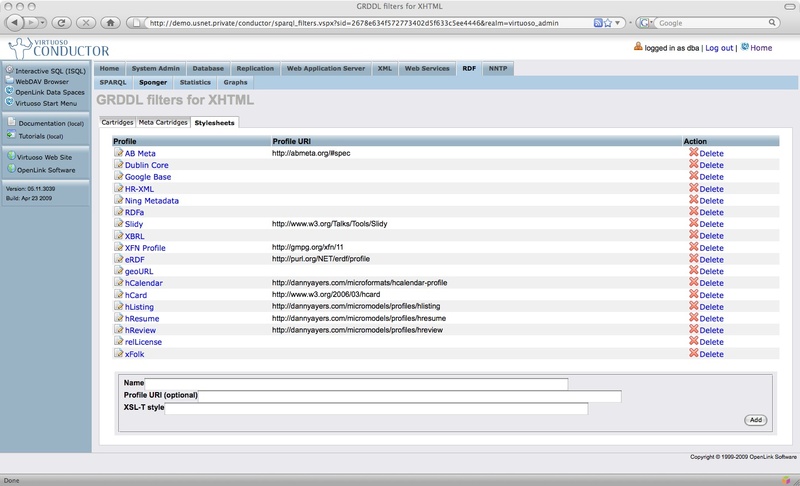 The proxy path /about/html returns an XHTML description of an entity as before, but now includes richer embedded RDFa. Although some of the examples in this document still refer to /about/rdf (which is still usable), please bear in mind that this path has been deprecated in favour of /about/id. Notice how requests to /about/id are redirected to /about/html, /about/data/nt, /about/data/xml or /about/data/json depending on the requested format. The required URL rewriting rules are preconfigured when the rdf_mappers VAD is installed. 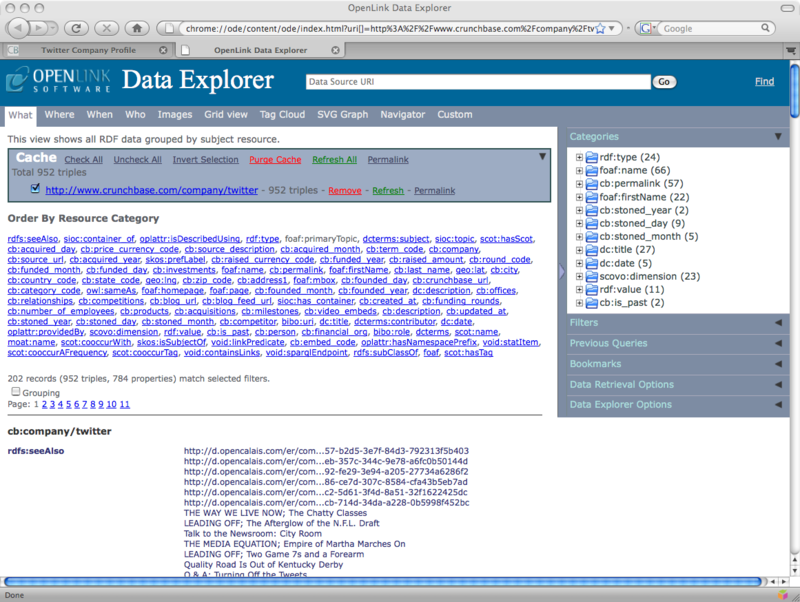 ODE is a Linked Data explorer packaged as a Firefox plugin (support for other browsers is planned). 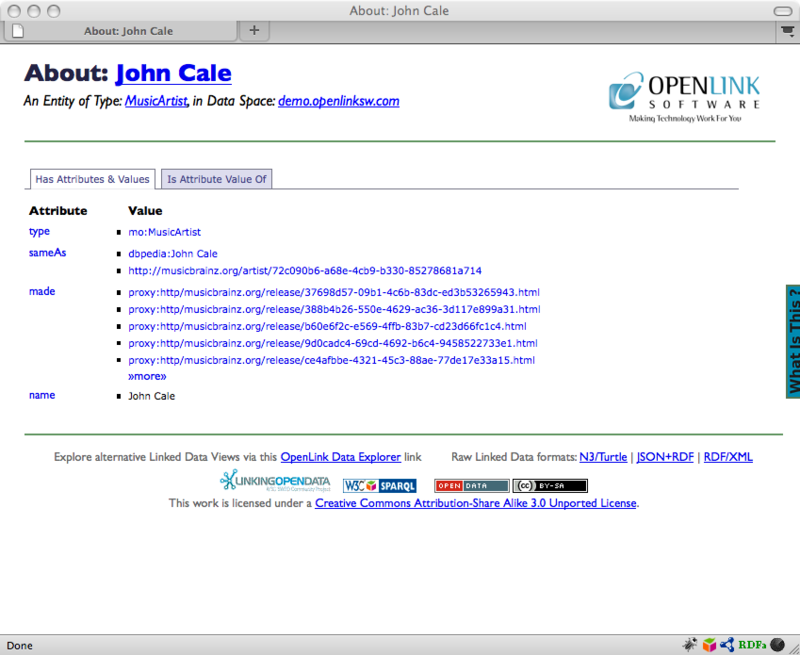 iSPARQL is an interactive AJAX-based SPARQL query builder with support for SPARQL QBE, bundled as part of the OpenLink Ajax Toolkit (OAT). Both RIA clients utilise sponging extensively. 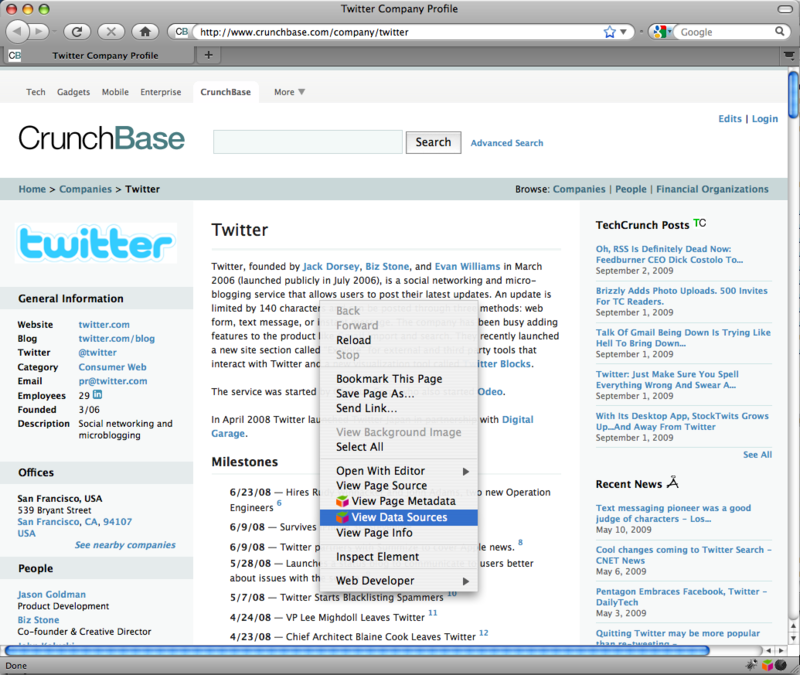 The RDF browser then displays RDF data sponged via the Crunchbase cartridge. Figure 6: ODE RDF browser displaying sponged Crunchbase data. iSPARQL directs queries to the configured SPARQL endpoint. When targetting a Virtuoso /sparql service, Virtuoso specific sponging options can be enabled through the 'Preferences' dialog box. 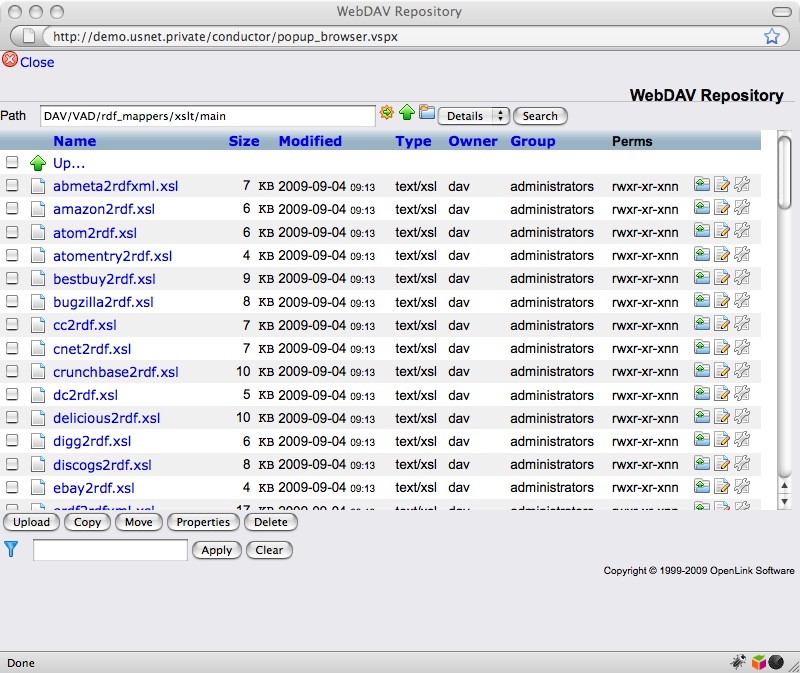 All public readable resources in WebDAV have their owner, creation time, update time, size and tags published, plus associated content type dependent metadata. This WebDAV metadata is also available in RDF form as a SPARQL queriable graph accessible via the SPARQL protocol endpoint using the WebDAV location as the RDF data set URI (graph or data source URI). REST-style Web Service APIs: Google Base, Flickr, Del.icio.us, Ning, Amazon, eBay, Freebase, Facebook, Slideshare, Wikipedia, Musicbrainz, YouTube, FriendFeed, CrunchBase, Digg, raw HTTP etc. Binary files: MS Office, OpenOffice, Open Document Format, images, audio, video etc. ODS has its own built-in cartridges for the SIOC ontology which it uses as a data space "glue" ontology. SIOC provides a generic data model of containers, items, item types, and associations between items. The actual classes defined by SIOC include: User, UserGroup, Role, Site, Forum and Post. A separate SIOC types module (sioc-t) extends the SIOC Core ontology by defining additional superclasses, subclasses and subproperties to the original SIOC terms. Subclasses include: AddressBook, BookmarkFolder, Briefcase, EventCalendar, ImageGallery, Wiki, Weblog, BlogPost, Wiki plus many others. Within this generic model, SIOC permits the use of other ontologies (FOAF etc.) in describing attributes of SIOC entities that provide sound conceptual partitioning of data spaces that expose RDF Linked Data. Superclasses include: Container (a generic container of Items) and Space (Data Spaces). Thus, it's safe to say that SIOC delivers a generic wrapper, or "glue", ontology for integrating structured RDF data from a myriad of heterogeneous web accessible data sources. Below is an extract from the stylesheet /DAV/VAD/rdf_cartridges/xslt/main/flickr2rdf.xsl, used for extracting metadata from Flickr images. Here, the template combines RDF metadata extraction and ontology mapping based on the FOAF and Dublin Core ontologies. Meta-cartridges in the meta-cartridge registry are configured to match a given MIME type or URI pattern. Matching meta-cartridges are invoked in order of their configured sequence value. Ordinarily the meta-cartridge hook function should return 0, in which case the next meta-cartridge in the post-processing chain will be invoked. If it returns 1 or -1, the postprocessing stops and no further meta-cartridges are invoked. 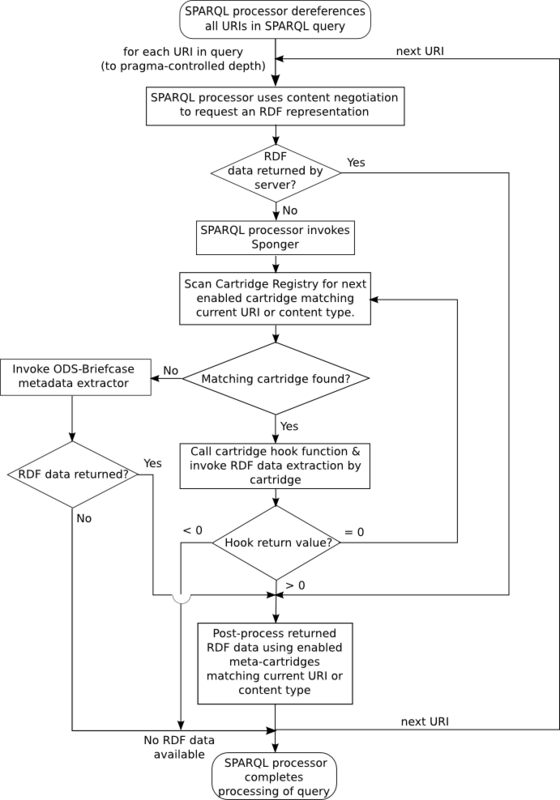 Notice that, as shown in the above flowchart, if the target URL returns RDF directly meta-cartridges may be invoked even if primary cartridges are not. Note: Meta-cartridges are only available in the closed source version of Virtuoso. The meta-cartridge feature is disabled in Virtuoso Open Source edition (VOS). Meta-cartridge stylesheets reside in DAV/VAD/rdf_mappers/xslt/meta. In VOS, this directory is empty. The rdf_mappers VAD (Virtuoso Application Distribution) bundles a variety of pre-built cartridges for generating RDF instance data from a large range of popular Web resources and file types. Appendix B provides full details of the VAD's contents. The cartridges installed by the VAD can be viewed and configured through Conductor's Cartridges pane reached via the RDF > Sponger tabs. The RDF Cartridges VAD package includes a number of XSLT templates, all located in the folder /DAV/VAD/rdf_cartridges/xslt/main/. 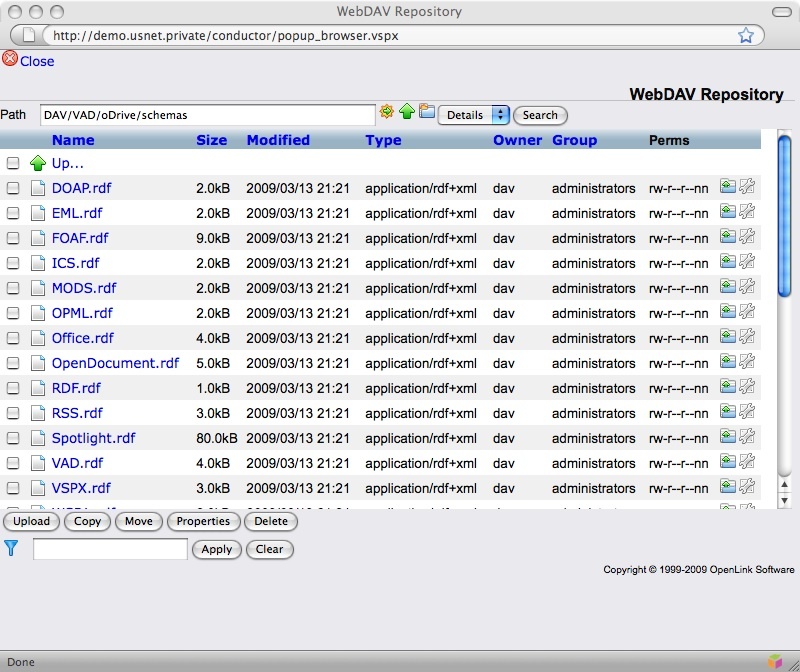 All the available templates can be viewed through Virtuoso's WebDAV browser, as illustrated below. The Sponger is fully extensible by virtue of its pluggable Cartridge architecture. New data formats can be sponged by creating new cartridges. While OpenLink is actively adding cartridges for new data sources, you are obviously free to develop your own custom cartridges. To this end, details of the cartridge hook and example cartridge implementations are presented below. In our first example (which is available in the form of an on-line tutorial ) we implement a basic cartridge, which maps the MIME type text/plain to an imaginary ontology which extends the class Document from FOAF with properties 'txt:UniqueWords' and 'txt:Chars', where the prefix 'txt:' is specified as 'urn:txt:v0.0:'. In order to allow the Sponger to update the local RDF quad store with triples constituting the sponged structured data, the role "SPARQL_UPDATE" must be granted to the account "SPARQL". This should normally be the case. If not, you must manually grant this permission. As with most Virtuoso DBA tasks, the Conductor provides the simplest means of doing this. (linkeddata.uriburner.com hosts a public Virtuoso instance.) Though this example demonstrates the action of the /about/rdf/ service quite transparently, it is a basic and unwieldy way to view RDF. As described earlier, the OpenLink Data Explorer uses the same proxy service to provide a more polished means to extract and view sponged RDF data. Here the sparql keyword invokes the SPARQL processor from the SQL interface and the RDF data sponged from page http://www.ivan-herman.net/foaf.html is loaded into the local RDF quad store as graph http://mygraph . The Virtuoso Sponger will, via the xHTML cartridge, automatically ingest any RDFa found when sponging an XHTML resource and cache the extracted RDF in the quad store. Conversely, if a client requests a resource description in the form of XHTML, Virtuoso will embed RDFa into the returned XHTML automatically. Virtuoso can generate RDFa for a sponged resource even if the original resource was not described using RDFa. Likewise RDFa can be generated for resources whose RDF descriptions were imported directly into the quad store, rather than being sponged. 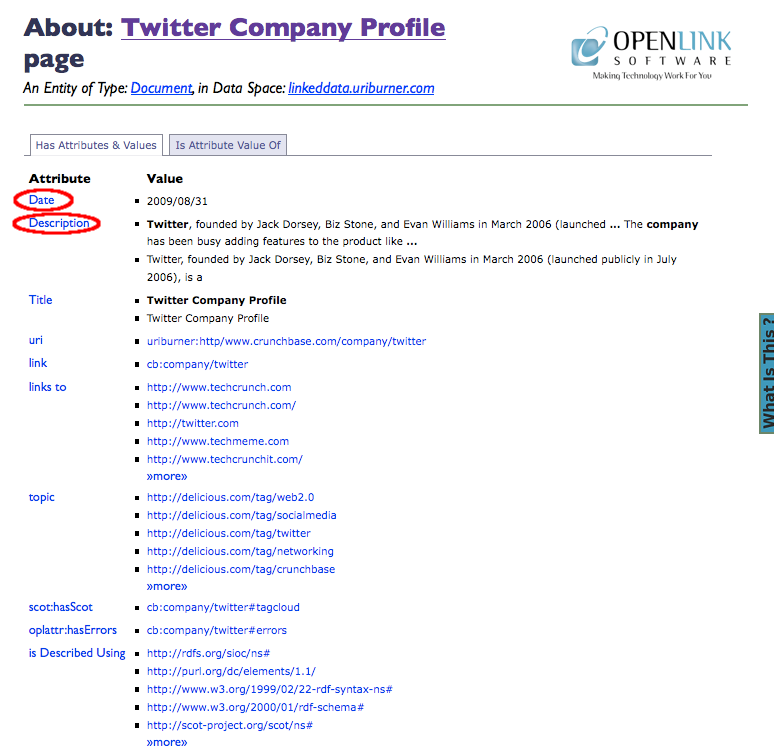 The screenshot below shows ODE's "View Page Metadata" output when http://www.crunchbase.com/company/twitter is sponged by the public Sponger at http://linkeddata.uriburner.com. 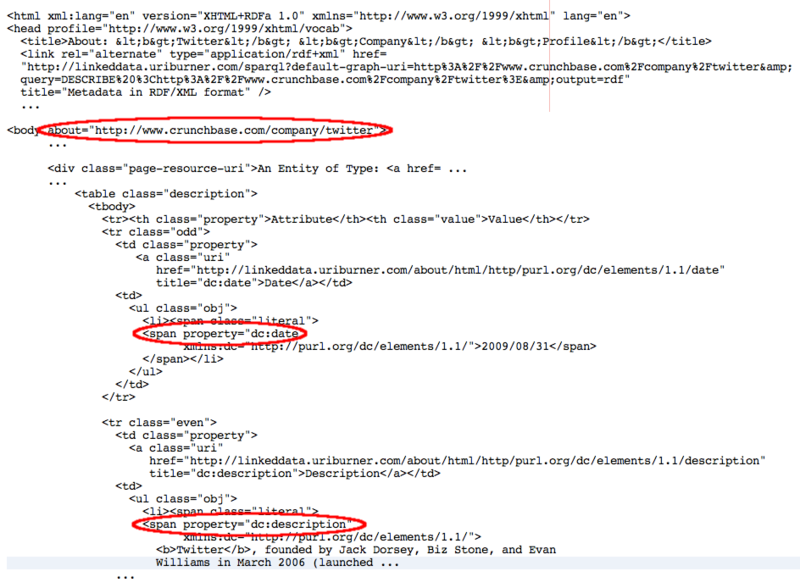 The subsequent screenshot highlights some of the RDFa markup in a heavily cutdown extract from the description.vsp generated page source. The schema files packaged in Briefcase cover both standard and custom ontologies. The standard ontologies include FOAF, OpenDocument, RSS , XBEL , Apple Spotlight and vCard. Others are proprietary OpenLink ontologies for describing file types and content. Virtuoso supplies cartridges for extracting RDF data from certain popular Web resources and file types in the form of the VAD (Virtuoso Application Distribution) package rdf_mappers_dav.vad. If not already present, it can be installed using Conductor or the VAD_INSTALL function. Please refer to the Virtuoso Reference Manual for detailed information on VADs and VAD management. Details of each of the cartridges contained in the rdf_mappers VAD are given below. OpenOffice documents contain metadata which can be extracted using UNZIP, so this cartridge needs the Virtuoso UNZIP plugin to be configured on the server. (Each OpenOffice file is actually a collection of XML documents stored in a ZIP archive). Ensure DirsAllowed includes directories /tmp, (or the temporary directory for the host operating system), lib and aperture. Configure the cartridge either by installing the rdf_mappers VAD or, if the VAD is already installed, by executing procedure DB.DBA.RDF_APERTURE_INIT. 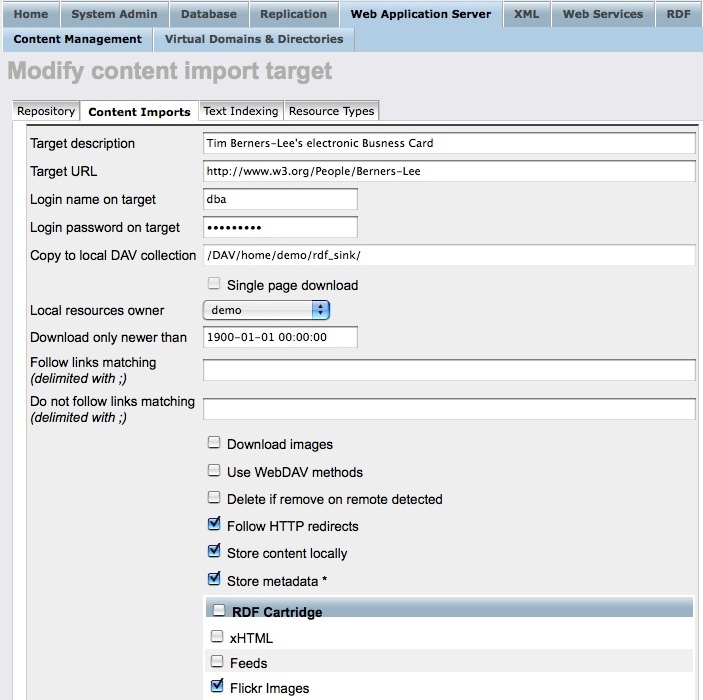 You should now be able to sponge all document types supported by the Aperture framework, (using one of the standard Sponger invocation mechanisms, for instance with a URL of the form http://localhost:8890/about/rdf/http://targethost/targetfile.pdf), subject to the MIME type pattern filters configured for the cartridge in the Conductor UI. By default the Aperture cartridge is registered to match MIME types (application/octet-stream)|(application/pdf)|(application/mspowerpoint). To sponge all the MIME types Aperture is capable of handling, changed the MIME type pattern to 'application/.*'. URIQA - The URI Query Agent Model . A model for interacting with Semantic Web enabled web servers. It introduces new HTTP methods to indicate to a web server that, for a given resource URI, it should return a concise bounded descriptionof that resource rather than a representation of it.